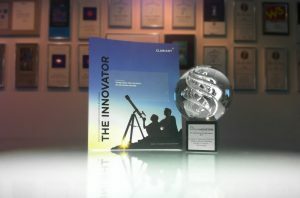 MARION Integrated Marketing was the 2013 AMA Houston Crystal Award winner for Clariant Oil Service’s The Innovator in the Best Company or Organization Brochure category. The AMA Houston Crystal Awards is an annual competition honoring Houston’s best marketing work. Clariant Oil Services is a world leader in the development, manufacture, application and supply of specialty chemicals and services to the oil and gas industry. The objective for The Innovator was to showcase the innovation of Clariant Oil Services and significantly raise market awareness of their products and services. In order to produce a publication that is relevant to audience needs, MARION worked closely with Clariant Oil Services to ensure that all messaging was accurate and concise. The award was presented at a ceremony on May 23, 2013. Here is a photo of the winning entry along with the Crystal Awards trophy. Congratulations to all!